Since I retired about three weeks ago, I have felt very little desire to continue this blog. Perhaps it is simply that nothing has seemed very entertaining since then. I have been busy enough, but perhaps not very happy. Still I have pictures that want to be displayed–a lot of them actually. 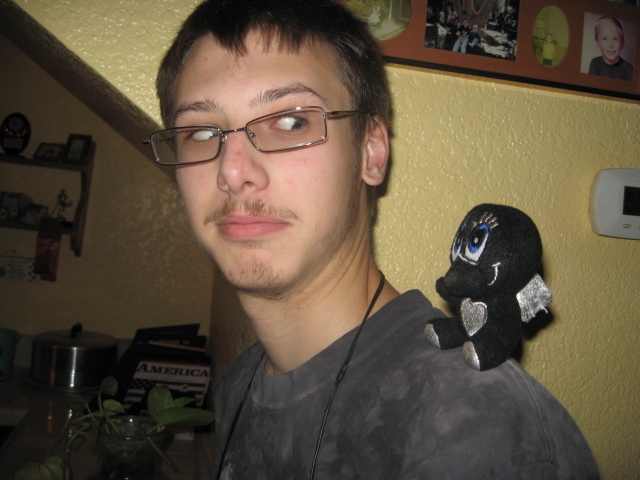 Perhaps if I just put some pictues up, some kind of a blog will emerge around them. Except for the cover shot of Monsters! Monsters! which seems to be left over in the camera from GenCon, these pictures all come from a party I attended on the night of August 18–the night after the afternoon when I told my boss at Palo Verde library that I refused to ever work for her again. That was the end of a library career lasting 36 years. Monsters! Monsters! 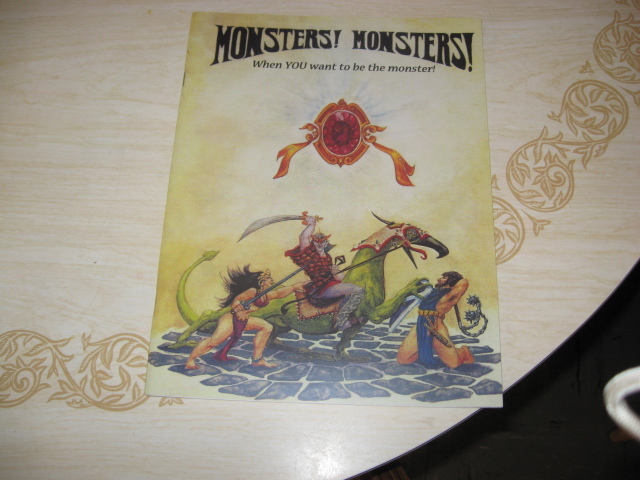 a game I wrote in 1976, reprinted for GenCon 2010. 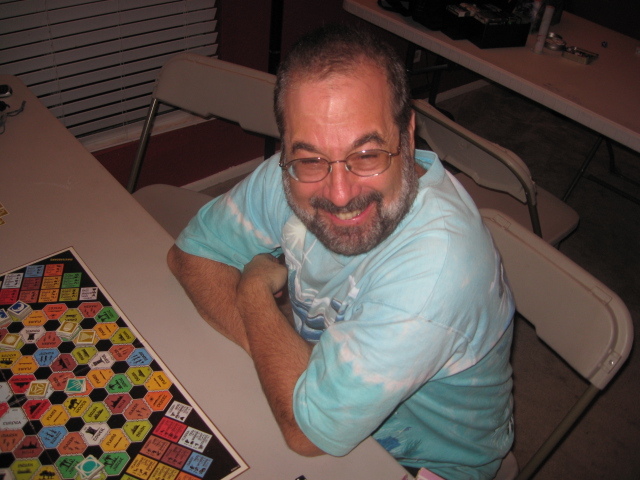 Luckily, instead of going home and being depressed, I had already accepted an invitation to go to a gaming party–someone’s house in North Phoenix, a nice place. 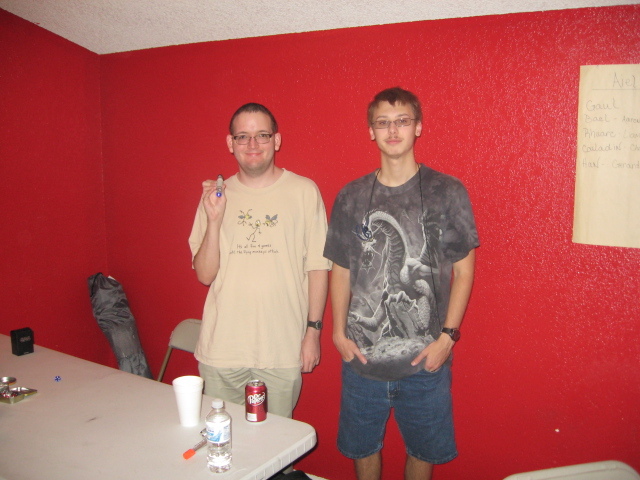 About 20 gamers of both sexes and ranging in age from 10 to 63 crowded the place. There was pizza, soft drinks, some booze–I abstained. After going around and saying hi to the very few people that I actually knew there, I commandeered a table, and ran a quick game of OgreOcre. This is a game that I invented, and am trying to promote a little bit. 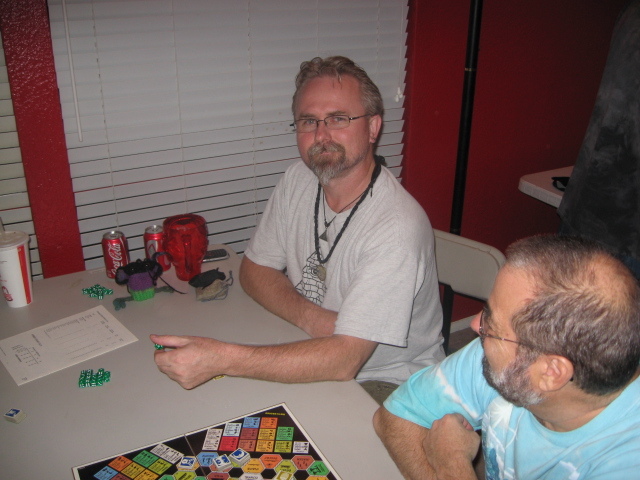 Morgan, my host at a gaming party on the night I retired--friendly guy, good host. 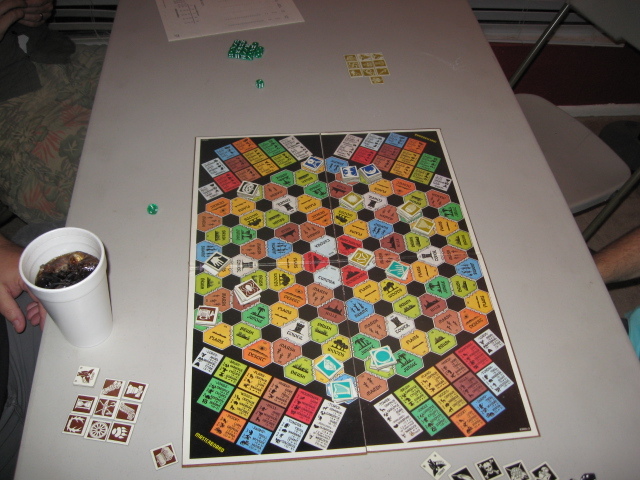 Titan, an old board game that I enjoyed at the party--I was winning when I had to go. Somebody. This guy was giving me the most competition in Titan. 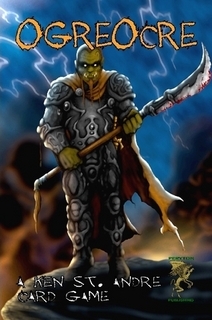 He owned the game, but I forget his name. Jesse Foster, leader of Steve Jackson's MIB contingent in Phoenix, is probably having fun at CopperCon this weekend. I'm not. My son James (left) and his friend Harley are gamers through and through. 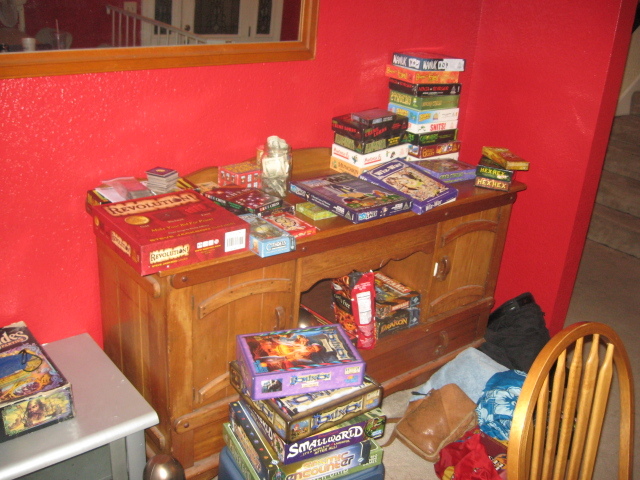 A sample of the games available at that party. There were more. What Gaming will do to you: note the alert but crazed expression on Harley's face. The party was still going strong at 2 in the morning when I left–I am such a wimp in my old age. I only stayed that long because there was a hellaceous summer storm that started about 11 p.m.–a real gully washer, and it would have been insane to go outside–we would have been soaked before taking five steps. When I was young, I used to game like this every Friday night. In those days we played a lot of Risk, some Diplomacy, and sometimes I would run a Tunnels and Trolls game. Good times! It is great to know that the weekend gaming tradition continues, even if I don’t get out to join them very often. 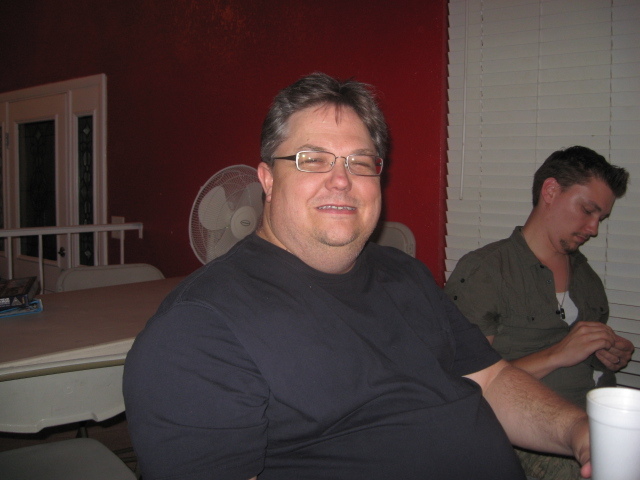 Yep….I’m Harlan, the competition at Titan. I friended you on FB, too. We’ll have to play again. ah i have to get something like that. I never usually buy to many board games because if i do i can only get together to play them every great once in a while. For example i bought a risk game two years ago..i’ve probably played it 5 times.